Did you know there are more public libraries than Starbucks in the United States? It’s true! 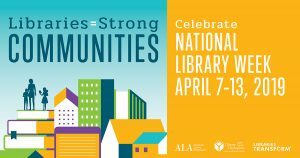 And this week is a great week to celebrate the libraries in your community. It’s National Library Week from April 7 to 13. This year’s theme is “Libraries = Strong Communities,” and Gates Foundation Co-founder Melinda Gates is this year’s Honorary Chair. Sponsored by the American Library Association and libraries across the country, this year’s National Library Week celebrates the theme of “Libraries = Strong Communities.” Libraries are key components of many communities, providing many services to many people: they provide free access to media, host special programs and events, and strengthen communities through education and lifelong learning. And for job seekers and career explorers, libraries can be a key resource. Libraries’ collections often include valuable books and other resources to help with career and education planning as well as job search. Many libraries also offer free workshops such as resume writing classes or interview practice groups. Many also host local job clubs. Curious about what your local library has to offer? Find branches near you with CareerOneStop’s Library Finder, and start exploring!